Half the battle to improving images is recognizing what is wrong with the picture. Practicing on many images over many hours will help you develop the eye. As you gain experience you remember how the scene looked when you actually took the picture. Use that memory to restore the image in PSP7 to your recollection of the scene. Usually, fixing tonal problems such as muddiness, flatness, too dark, too light, will fix most of the perceived color problems at the same time. Sometimes, but not always. I recommend fixing the tonal problems first then tackling any remaining color problems like color casts or saturation issues. Less is more. Image correction is pretty subjective. The old adage of "Beauty is in the eye of the beholder" surely holds true. Each person sees an images flaws and features differently. Correct images to please yourself first. For clients, I fix up the image to my liking and then make any changes to please their eye. The histogram is your friend! Use it to assist you in "seeing" the problems in an image. Paint Shop Pro 7's Histogram has the advantage of remaining on screen as a palette through an image editing session. Open the test image for the day. Geese.jpg. Select the background layer and make sure all the other layers are turned off. Press the H key on the keyboard to open the Histogram. Uncheck all the boxes at the bottom except for Greyscale. Note the bell type curve on a horizontal scale of 0 to 255. Pure black is represented on the very left with a value of 0 and pure white on the right with a value of 255. From the PSP Help files... By examining the graph, you can learn whether the image contains enough detail to be successfully corrected, and if it does, where the image needs correcting. If the graph is spread across most of the Histogram, the image contains enough detail to correct it successfully. If the graph is compressed into a narrow area of the Histogram, the image probably doesnt contain enough detail. Make a new scan or find another picture. In an image with enough detail, the position of the graph on the Histogram shows where the image needs correcting. A fairly even distribution of the graph indicates an image with a balanced composition. If too much of the graph is situated on the right side, you need to reduce the images lightness. If too much is on the left, you need to increase it. If the lines are not spread out enough, you need to increase the contrast. 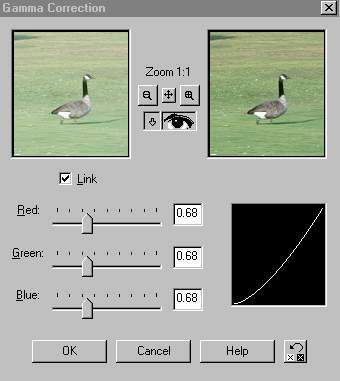 Notice in the Histogram for Geese.psp that a majority of pixels are clustered into part of the upper range. Notice also there are no pixels at the very darkest range, near 0. This image then would be considered a "high key" image, and since the graph show most of the pixels in a fairly narrow range, it needs a contrast adjustment. 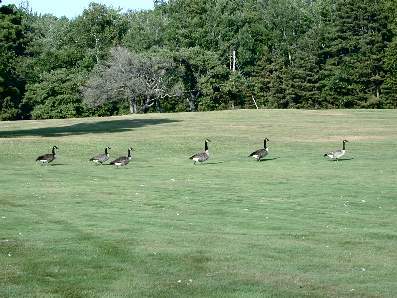 Observe the Geese picture. Notice how flat the color looks. The greens all look similar and the image dull and a bit muddy. I recall this this scene, taken in Maine in July, as a bit dried up. However, the grass was greener in the green areas and browner in the brown areas. The dead tree in the background had a tinge of purple in its crown and the forest line sported different shades of green, with reddish tinges on some of the evergreen spruces or firs. Even the geese were more colorful. So what's wrong here? Basically the image is too light and lacks in contrast. My guess is that when the tonal range is improved, the color will take care of itself with just a touch of tweaking. Let's go over ways to fix this up in Paint Shop Pro 7. We have a LOT of choices with several good ones. The easiest fix often is adjusting the gamma value of the image. 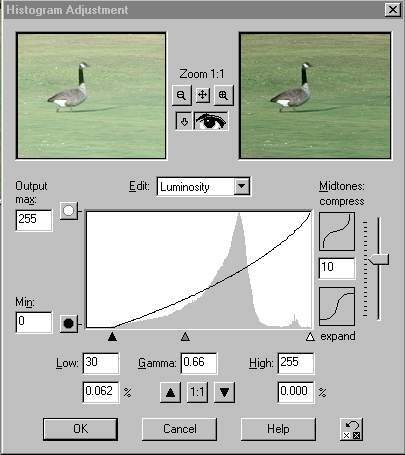 Gamma adjusts only the midtones without changing the darkest and lightest values. To adjust the gamma, go to Colors > Adjust> Gamma Correction from PSP's Menu Bar. On the Gamma Correction Dialog box, make sure the Link box is checked then fiddle with the sliders lowering the gamma to about .68 or whatever looks good to you. This makes the image darker. Now the color really pops out and the image is substantially better! Press UNDO on the tool bar to undo the gamma correction. A second way to improve the image is Using PSP's Histogram Adjustment Function which combines a Gamma adjustment with Levels and Curves for a pretty quick fix. Select Colors from the Menu bar and Histogram Functions and Histogram Adjustment from the flyout box. Slide the black upfacing slider arrow found under the graph to the right until the black line meets the grey start of the graph at a value of about 30 Note how the darks in the preview image become richer and darker. Slide the Gamma or Midtone slider, the grey upfacing arrow towards the left until it reads about .66. In the preview notice how the midtones take on a darker richer tone. Use the vertical slider on the right side of the dialog box to compress the midtones or to expand them. In our case, move the slider on the right side up to about 10. Press OK to apply to the image. Compare the results to the Gamma adjustment sample above. We have done even better with Histogram Adjustment, I think. Press Undo to go back to the original image. A third method of improving tonal quality is using a Levels adjustment layer. Levels, like the histogram adjustment, enables you to darken the dark tones and lighten the lights as well as change the midtones. 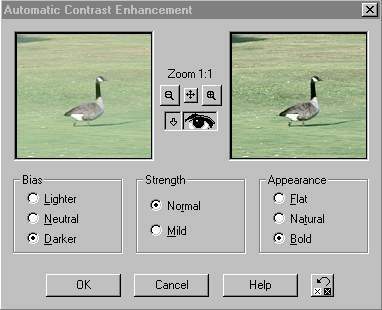 In addition, adjustments may be made in one or more color channels at the same time. I usually use a Levels layer when working with photos. On the Layer Properties box, Adjustment Tab, start by selecting RGB in the Channels drop down box at the top. This should show by default. For this example, I slid the input slider, the black diamond, to the right until it read 41 in the corresponding box. I slid the white or highlight slider on the left side to the right to 231, to lighten the lightest tones in the image. Then I moved the midtone slider, the middle diamond to .70. Press the Continuous preview button located next to the Eye icon near at the bottom of the box to watch image change in real-time. This effectively backs some green out of the image's midtones, letting the purple and red tones in the background tree line pop out. Press OK to apply the Levels Adjustment. The beauty of using an Adjustment Layer for levels is by double clicking the layer name on the Layer palette one can fine tune the adjustments. Or you can delete the layer completely if you like. It is a non destructive non permanent way to adjust the tones in the image. On the Layer Palette, click the eye glasses icon next to the Levels layer, turning off its visibility. Like the Histogram Adjustment and the Levels function, Curves allows you to change the darks and lights and midtones in both the RGB channels and in each individual channel. However, the ability to fine tune the tonal curve is much greater than with the other two. Go to Layer on the Menu Bar and New Adjustment Layer then pick Curves from the flyout box. On the Layer Properties box, choose RGB channel from the down facing arrow under Channel. First darken the dark tones. Click on the node in the bottom left hand corner of the box and move to the right along the bottom of the graph area. OR, Slide the input value to 41 or type in the number in the box. Next, pick the top node in the upper right corner of the box and slide it to the left across the top of the graph area until the input area read 250. This lightens the lightest tone in the image closer to white. Then click about half way down on the red line to set a new node. Click to add another point in between the middle point and the top one and move it to about input of 198 output of 201. A curves adjustment lets you set up to 16 individual points in along the histogram line where you can make very fine adjustments to a range of colors in the area. Pick the Green Channel from the Channel drop down box. Set a point in the middle of the line in the chart. Pull this node down and a bit to the right until the input and output values are close to 138 and 122. Press OK to set the Curves adjustment layer. Remember, since its on a layer, double click the layer to fine tune the adjustments at any time. Notice in the image how the dead tree and the evergreens in the background tree line have taken on a reddish or purplish cast. That's more what they really looked like. Select the background layer and turn off the visibility on the Curves layer by clicking the Glasses icon next to the layer name. "Use the Manual Color Correction feature to make color changes to an image or to create a variety of unusual effects. This feature adjusts colors based on the hue, saturation and lightness (though it does not use the HSL color space). This adjustment is useful when it is particularly important to get some color, such as a skin tone or a corporate logo, exactly right. It is also effective for images with grossly incorrect colors." With the background selected on the layer palette and any other layers turned off, go to Effects > Enhance Photo > Manual Color Correction. 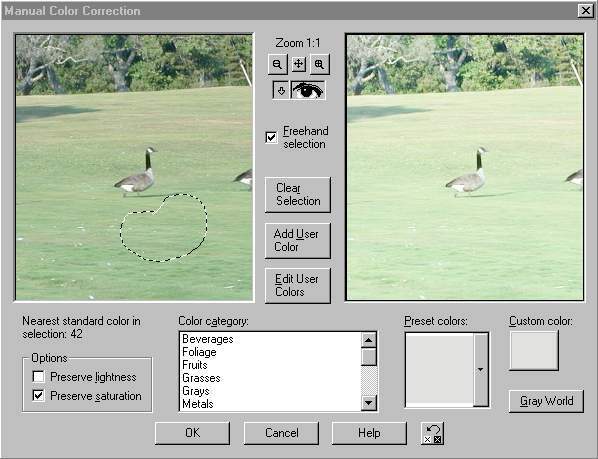 On the Dialog box, check the Freehand selection box and drag rough selection around a patch of grass under the goose as shown below. This is the Source hue to shift the image colors From. At the bottom of the box in the Color Category area, click on grasses. Immediately the preview on the right of the dialog box shows the effect of the green default on the image. This represents the Target Hue to shift the image colors to. At the bottom left, UNcheck preserve lightness and Check preserve saturation for the best results. All the pixels in the Image which contain the source hues are shifted to the target hue and the remaining colors adapt to the selected colors and shift to appropriate hues. The default grass makes the image a bit too dark. Under the Preset Colors area, click the down facing arrow next to the color swatch. Pick Grass Normal from the flyout box. With this setting, the whole image looks so much better. Press the OK button to apply to the image. Manual color works almost as well here as Levels or Curves Adjustment without having to fiddle with sliders and such. Click the UNDO button to undo this correction and let's try another method. Use the Clarify to sharpen or focus blurred images. It adds a crisp, focused look to an image so that objects stand out. With the background selected and the other layers turned off, go to Effects > Enhance Photo.. and Clarify. In this case, use a strength of 5 on the dialog box to improve this image. Normally a value of 2 works pretty well. Press OK to see how the image improves. Press the Undo button on the Tool Bar to get back to the original image. 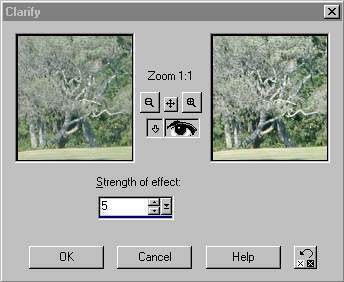 Go to Effects > Enhance Image > Auto Contrast on the Menu bar. On the dialog box set the Bias to Darker by clicking its radio box. Set the Strength to Normal and the Appearance to Bold. Press OK and note how contrast in the image is much, much better although not as exciting as a Levels, Curves or Manual Color Correction. Undo the Filter by pressing the Undo button. 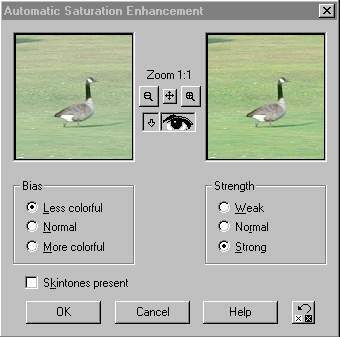 Use the Automatic Saturation Enhancement dialog box to adjust the saturation of the colors in your image automatically. The saturation of a color determines its vividness. Saturated colors appear bright and brilliant, like fire-engine red. On PSP's Menu bar go to Effects > Enhance Image > Automatic Saturation. For this image I checked Less Colorful for the Bias and pick Strong for the Strength. It makes the greens greener. Not really a good enhancement for this image, however. Apply and observe the changes. Then Undo to restore the original image. Auto Saturation come in handy when the image is in good tonal condition but the colors are too muted, or grey. There you have it. Hopefully, this information will provide more options when correcting the problems in an image.